The Orthodox church under renovation inside Medzhybizh castle. Originally built in 1586. 19th century mill buildings adjacent to the mill dam and the lake on the Southern BugMedzhybizh is first mentioned in chronicles as an estate in Kievan Rus. It was given to Prince Svyatoslav by the prince of Kiev in the year 1146. In 1148, ownership transferred to Rostyslav, the son of Yuri Dolgoruky. The wooden fortress that stood there was destroyed in 1255. After the Mongol incursion, by 1360, the town and surrounding territory passed into the hands of the Lithuanians. The town suffered from numerous attacks by the Tatars in 1453, 1506, 1516, 1546, 1558, 1566, and 1615. In 1444 the town was incorporated into lands administered by Poland. In the 16th century, the territory was controlled by the Sieniawski and Potocki Polish noble families. In 1511 work began to replace the wooden palisades with massive stone fortifications, many of which can still be seen today. 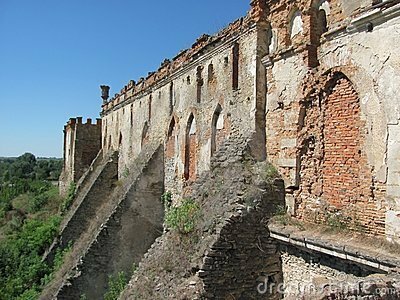 A dam was built across the Southern Bug river to provide a defensive lake, and a rhomboid Medzhybizh Castle with four towers was built. The state-of-the-art fortifications made Medzhybizh one of the strongest military sites in the region and led to the rise of its prosperity in the next three centuries. - In 1571 a census was recorded, listing the population as being made up of 95 Ruthenians, 35 Jews, and 30 Poles. In 1593 Adam Sienawski gave the town Magdeburg rights.